Are you Team Real or Team Faux when it comes to Christmas trees? Every holiday season, approximately 33 million real trees are sold in the U.S., compared to 9.5 million fake ones. And together, the total expenditure on Christmas Trees reaches nearly $2 billion annually. Regardless of which side you’re on, there are several ways you can save money this year on the most important seasonal decor item. So before you deck the halls, consider these tips to keep your holiday (and your budget) merry and bright. During this festive time, it’s easy to get caught up in the spirit of tree shopping and opt for the biggest one you can find. Hold up, Griswold: you still have to fit the tree in your living space and have the means to transport it. Before you head out, measure your space and determine a range of height and widths that will work best. If you have a sturdy platform on which to place the tree stand, you can get away with a shorter, less-costly tree without sacrificing style. Well-hydrated trees are the best value because they’ll last longer in your home. When shopping for a real tree, inspect the branches closely and look for a rich green hue that’s slightly moist and fragrant. Trees that are already dropping needles should be avoided. With faux firs, the “needles” should also stay intact when you run your fingers through them. If you opt for a pre-lit tree, consider timeless white lights to multi-colored or blinking strands, as the former will last through several holiday themes. Prices on real trees vary by more than just size; species is also factor, due in part to growing speeds since trees that grow more quickly can be brought to market faster and are therefore less costly than slow-growing species. Douglas and Balsam firs are among the cheaper species, while Noble and Fraser firs are more expensive, though not as costly as Turkish and Nordman firs. For more information about Christmas tree species and characteristics, consult the National Christmas Tree Association. It’s tough to beat the smell of fresh pine leading up to Christmas, but purchasing a new tree every year can be more costly than buying a faux tree to use again and again. A pre-lit 7.5′ fake tree can range in price from $60 to over $600, so it pays to shop around. Fake trees are also best purchased closer to Christmas as stores start marking them down to clear inventory. To benefit from that fresh mountain smell, purchase some real juniper stems or a juniper wreath for much less than the cost of a real tree. At CouponSherpa.com you can find coupons for extra savings on trees and decor such as 30% off at Brylane Home or $50 off holiday purchases of $100 or more using a Target coupon code. For fake trees, watch the price even after you’ve made the purchase: Target, Kohl’s and even Sam’s Club offer price adjustments within one to two weeks. Finally, ask stores to price-match their competitor on identical trees. Use the Invisible Hand browser add-on to compare prices instantly online. For example, a 7.5′ PVC Slim Artificial Christmas Tree with Clear Lights is priced at $138.99 on Wayfair, while Houzz is currently selling the same tree for $101.23 plus free shipping. Some faux trees come bedazzled with fake snow, pinecones, berries and even fiber optic tips. These additions are pretty but pricey, and you can add embellishments yourself for less. Same goes for pre-decorated trees: you pay a premium for a professionally trimmed tree since ornaments and other embellishments can be purchased on the cheap. A simple tree also allows you to change your decorating style over the years. Putting off your real tree shopping will give you more negotiating power. Since the product has both a season and a shelf life, tree sellers will be eager to get rid of inventory as Dec. 25 nears. Check out the inventory this week and if there are still plenty of quality trees available, try your haggling skills. You’ll have even better luck next week if you can hold out that long for holiday decorations. Consider a “Charlie Brown” tree. A lush, symmetrical Christmas tree is likely on your shopping list, but keep your eyes peeled for a slightly flawed tree to save money. Trees are often positioned against a wall or in a corner, so missing branches or a flattened side can be easily disguised. 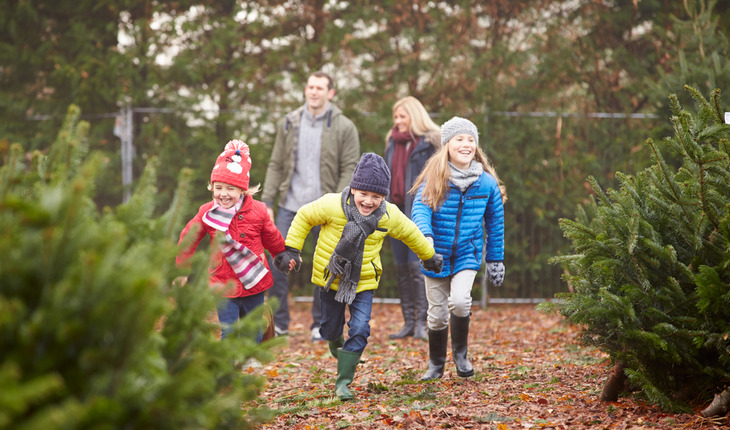 Plus, your kids will likely enjoy the kitschy, unique nature of your less-than-perfect tree, a lesson everyone can learn something from these days!